A long-wave trough sitting NW of Iberian peninsula with a strong cold front crossing SW Europe. A broad SLGT risk has been issued for parts of UK, eastern Atlantic and Iberia with threat for heavy convective rain, marginally large hail and strong to severe winds. 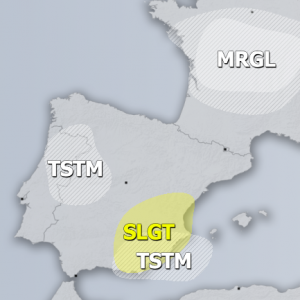 Iberia will be closely monitored for a possible upgrade into MDT risk on DAY 1 as some uncertainities regarding the coverage of severe storms exist attm. 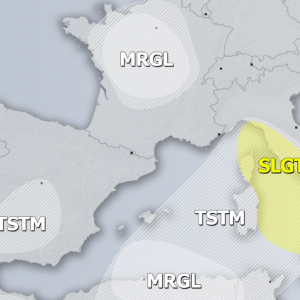 A SLGT risk has been issued for parts of northern Mediterranean and SE France with threat for heavy rain, strong winds and marginally large hail.